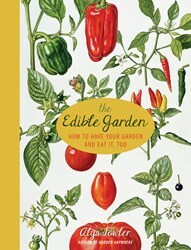 BBC Star Alys Fowler presents The Edible Garden: How to Have Your Garden and Eat It Too, out now from Viva Editions. The Edible Garden is truly the ultimate gift for gardeners and the gardening-curious, with instructions for keeping gardens flourishing and reaping the harvest with jams and much more. Red Dirt Ramblings calls it a "visually entertaining vegetable garden book, with plenty of meaty information," and Autumn Blues Reviews says it is "a gift that will always be remembered." Whether a hardy homesteader or just getting started with a few herb pots on a windowsill, The Edible Garden offers food for thought on creating a haven that is as beautiful as it is delicious. Master gardener and BBC personality Alys Fowler has devoted her life to teaching people how to grow their own floral food and edible landscaping. Here, Fowler shares her trademark wisdom and inventive tips to help your garden grow abundantly—from saving and sowing your own seeds, to mixing the world’s best compost, to brewing herb teas and growing such a bounty of veggies that you will have to learn how to pickle and preserve them! Good for the pocket, good for the environment and hugely rewarding for the soul, The Edible Garden provides a taste of the good life to anyone willing to pick up a trowel. Alys Fowler trained at the Horticultural Society, the New York Botanical Garden and the Royal Botanic Garden at Kew. After finishing her training, she worked as a journalist for the trade magazine, Horticulture Week, and then joined the Gardeners’ World team as a horticultural researcher. The lure of the garden, however, proved too much and in 2006 Alys became Head Gardener at Berryfields. She is now a permanent presenter from Greenacre, the show’s new home. Alys’s inspiration for urban gardening comes from her time volunteering in a community garden on the Lower East Side in Manhattan, New York City. Much of the ethic, thrift and spirit she encountered there is found in her work today.